Long term complications requiring reoperation after laparoscopic adjustable gastric banding (LAGB) occur with relative frequency. Little is known about the impact of revisional surgery on patients’ weight, an essential consideration when deciding to reoperate and choosing a revisional procedure. 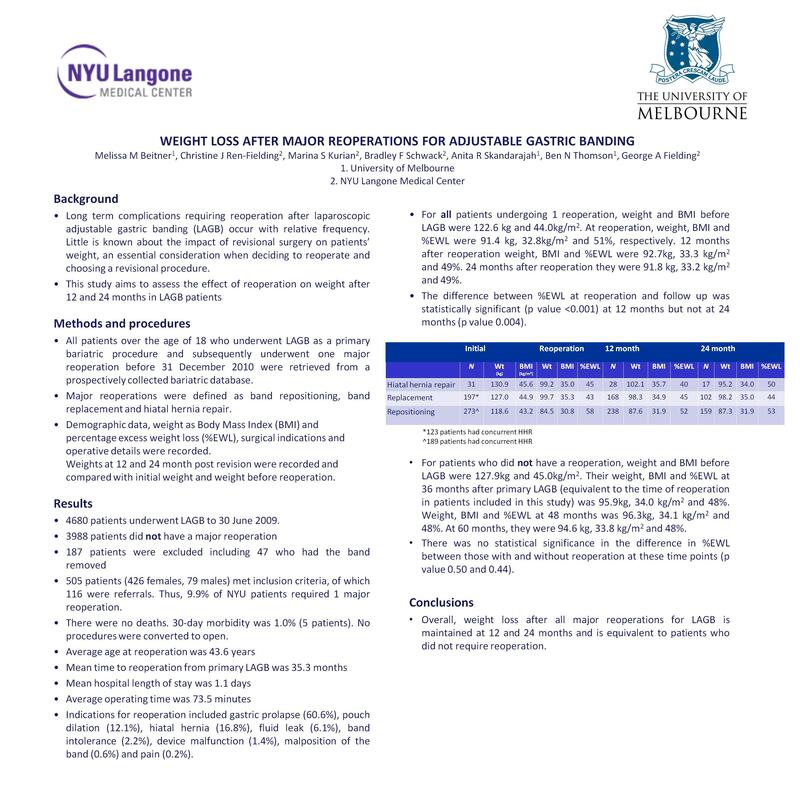 This study aims to assess the weight of patients who have had a major reoperation after LAGB with 1 and 2 year follow up. All patients who underwent LAGB as a primary bariatric procedure and subsequently underwent one major reoperation before 31 December 2010 were retrieved from a prospectively collected bariatric database. Major reoperations were defined as band repositioning, band replacement and hiatal hernia repair. Demographic data, weight as Body Mass Index (BMI) and percentage excess weight loss (%EWL), surgical indications and operative details were recorded. Weights at 12 and 24 month post revision were recorded and compared with initial weight and weight before reoperation. Data were described using the mean and range and in the study of outcomes, changes in %EWL were compared using the paired T-test with a 95% confidence interval. 423 patients were included. Age at primary banding was 40.4 years, initial weight was 122.8kg (range 69.9-220.4kg) and BMI 44.2kg/m2 (27.0-69.0kg/m2). Reoperation occurred 34.8 months after primary LAGB. Age at reoperation was 43.3 years, weight and BMI had decreased to 91.9kg (44.5-177.3kg) and 33.0 kg/m2 (18.9-57.7kg/m2) and %EWL was 50.3 ( -13.0-127.0). Weight, BMI and %EWL at 12 and 24 months after reoperation was 92.5kg (49.0-163.7kg), 33.4 kg/m2 (19.0-60.6 kg/m2) and 47.8 ( -41.0-114.0) and 92.8kg (47.6-166.8kg), 33.6 kg/m2 (19.8-54.1kg/m2) and 48.1 (-12.0-115). The change in %EWL for the entire study population was -3.9 from reoperation to 12 months and -4.1 from reoperation to 24 months. Theses changes in %EWL are statistically significant P= <0.001 (to 12 months) and P=0.001 (to 24 months). Overall, weight loss after all major reoperations for LAGB is maintained at 12 and 24 months. Despite variability in procedures, indications and starting weights, surgeons and patients can feel assured that weight maintenance with adequate follow up is possible after reoperation for LAGB.